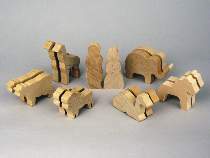 Wood Noah's Ark figures in solid maple. Range in height from 1-3/4" to 3-1/4". You get Noah and his wife, 2 giraffes, 2 elephants, 2 cows, 2 lions, 2 camels and 2 horses - 14 in all.